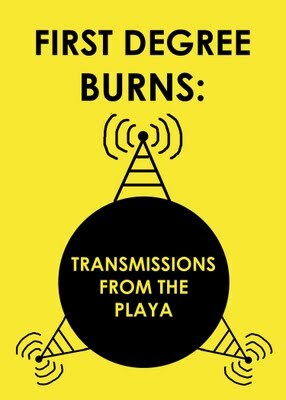 Arthur Graham has launched 40 transmitter books on a reconnaissance mission to the fiery playa planet! With the goal of establishing contact between the alien species inhabiting Black Rock City and the default world, his hope is to collect as many transmissions as possible during the week of the 2011 event. So be on the lookout for those black & yellow composition pads orbiting around the man — Your stories, quotes, questions, comments, jokes, recipes, and doodlings are the data he is after! How many transmitters will make the rigorous journey back to the default world with their messages intact? How many will regrettably burn up before re-entry? There is simply no way to know…. Only one thing is sure: All notebooks that find their way back to Arthur Graham will have their pages scanned into a free eBook and gifted via download to the farthest reaches of the cosmos. I am honored and excited to be one of the 40 first custodians of a transmitter book, and I can’t wait to set it free on its journey into the vast expanse of Black Rock City!